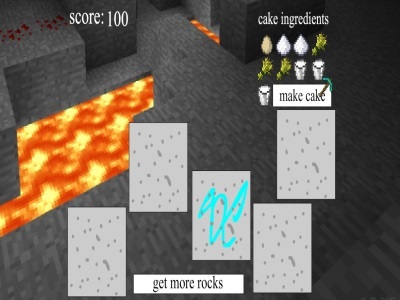 The Minecraft has broken any regulations hindering the creativity of both creators and players, and Minecraft Cake Ingredients is one small example. Normally, we dig for resources to build houses to stay or towers to avoid monsters like zombies. Now we are digging for basic materials to craft a cake. These ingredients are kept in the blocks under the ground. Maybe you take a bit long to collect all of them. The scores are on the screen. The sweet taste of cakes can make monsters’ souls become softer, so this time you try to make a delicious cake to give monsters. By the way, in the end you will be surprised. You use the mouse to break blocks to get ingredients.